A. Bruce McClure grew up in Cincinnati and received his elementary and secondary education in its public schools. He attended college and law school while working as a clerk in the Cincinnati post office. He earned a BA from the University of Cincinnati and a law degree from Chase Law School. McClure was interested in politics and public service. He worked as a social investigator for the city of Cincinnati from 1933 to 1935. During World War II, he was area supervisor in the War Manpower Commission. He was elected to the Ohio House of Representatives in 1950 and served four terms. During his years in the House, McClure was a member of the Finance and Education Committees and was chairman of the Welfare Section of the Finance Committee. He was especially concerned with legislation in the areas of education, local government finance, public welfare, fair employment practices, mental health, and penal and correctional institutions. McClure enthusiastically involved himself with community organizations. He was a Mason and was active in Boy Scouts. 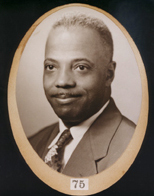 He was a member of the Lincoln-Douglas Republican Club and the Alpha Phi Alpha Fraternity. After the death of Jesse D. Locker, U.S. Ambassador to Liberia and McClure's former law partner, in 1955, McClure was considered as a possible successor to the ambassadorship. In 1957, he was also considered for a federal judicial appointment in the Virgin Islands. In 1958, the Republican Party nominated him for a fifth term in the Ohio House, but McClure died in office before he could complete his campaign for re-election. He left behind his wife Jewel Smith McClure and two young children, Alvin Bruce, aged five, and Judith Ellen Bruce, aged two. Cincinnati Enquirer, 15 October 1958, A-12. Roll 2628.